Melanie Hoffert longs for her North Dakota childhood home, with its grain trucks and empty main streets. A land where she imagines standing at the bottom of the ancient lake that preceded the prairie: crop rows become the patterned sand ripples of the lake floor; trees are the large alien plants reaching for the light; and the sky is the water’s vast surface, reflecting the sun. Like most rural kids, she followed the out-migration pattern to a better life. The prairie is a hard place to stay particularly if you are gay, and your home state is the last to know. For Hoffert, returning home has not been easy. When the farmers ask if she’s found a “fella,” rather than explain that actually she dates women, she stops breathing and changes the subject. Meanwhile, as time passes, her hometown continues to lose more buildings to decay, growing to resemble the mouth of an old woman missing teeth. This loss prompts Hoffert to take a break from the city and spend a harvest season at her family’s farm. While home, working alongside her dad in the shop and listening to her mom warn, “Honey, you do not want to be a farmer,” Hoffert meets the people of the prairie. Her stories about returning home and exploring abandoned towns are woven into a coming-of-age tale about falling in love, making peace with faith, and belonging to a place where neighbors are as close as blood but are often unable to share their deepest truths.
" 'Over the last ten years I have been trying to resolve a seemingly simple dilemma: how to tell the state of North Dakota that I am gay.' That's the heart of this involving memoir by a woman who grew up on a farm near Wyndmere, N.D."
"Hoffert's bittersweet and compelling memoir recalls her struggles at ending her silence and creating a fuller life for herself." 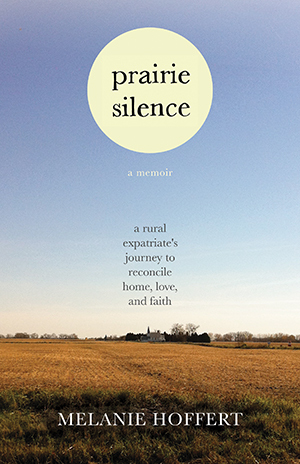 "A heartfelt coming-out story as well as an eloquent elegy to a rural way of life that is rapidly vanishing from the American landscape." "The author's mostly quiet narrative includes a wealth of haunting images and ideas that will linger long after the last sentence. A heartfelt love song to a place and its people as well as an honest and rewarding rendering of the author's interior landscape." “Do you think it’s weird that I want to drive a grain truck for a while” my friend Melissa asks me over the phone. “A grain truck? Seriously” I tap my keyboard as I talk and notice that it is filthy, embarrassing almost. The keys are sticky and filled with crumbs. The entire board is splattered with coffee drips. Disgusting, I think. I visualize Melissa, who is working in San Francisco, in a loft with high ceilings and little geometrical work stations lined with Macs. I imagine people wearing dark-rimmed eyeglasses, suit coats, torn jeans, and sneakers, popping their head into her office and flashing white smiles against tanned skin. Melissa herself is covered with tattoos and wears only eighties-vintage clothing, an appearance probably more reflective of her passion for music and pop culture than her day job at a publishing house. “Ma, I work on a computer. Everyone does.” I’ve told her. “Yes. Seriously,” Melissa continues, breaking into my thoughts. I am, I realize, slightly impressed that my modest friend used to drive a grain truck as a kid. As a child I drove tractors but never trucks. My dad propped me behind the wheel of his John Deere tractor when they were short of hired men. I pulled the coulter chisel, a giant rake-like appendage, to loosen the soil before plow- ing. But I never had to drive a truck, where you had to be tall enough to reach the clutch while managing the long stick shift. “Oh, my God. You’d be fine.” I give her the old you’d be fine’hand wave, as if she can see me. “Pick it back up in no time,” I say. Melissa and I are both children of the North Dakota prairie. She grew up in a tiny town, Northwood, population 959, near the northern border of the state. I grew up on a farm eight miles outside of Wyndmere, population 533, on the southern border at about the same longitude as Northwood. Both small towns have a railroad that runs through the center, a grain elevator, a gas station, a Catholic church on one side of town, a Lutheran church on the other, and a few bars in between. In fact, our hometowns fit the description of most North Dakota small towns. “I can see you driving a grain truck.” I continue, savoring the vision of my thirtysomething friend--a tattooed San Fran- cisco DJ with dyed black hair--driving a grain truck down gravel roads. Then I imagine all of us--those who left North Dakota--coming back, settling in with the farmers, filling the small-town bars at night, Schmidt beer in hand, talking about literature and the grain markets. “You can” Melissa asks, in her typical soft and humble way, as if her ideas are never good until someone else agrees. “Would you? Really? You’d come to North Dakota to be my roadie” she laughs. I think of my family farm during harvest right then, how harvest nights in the middle of the country seem almost cosmopolitan: bright, moving, awake, and alive. The moon glows like an orange pumpkin in the sky. Trucks light up the yard as they come in from the fields to empty their bounty. Once drained, they re- turn to the dark night for another hit of golden crop from the combines. All of this activity stirs the crisp, corn-filled air, which makes it smell like someone is baking sweet corn muffins from somewhere deep within the earth. All the while, real cooking is happening inside, where Mom is making hamburgers and fried onions for my dad and brother, who will come in exhausted and dirty well past ten o’clock. Melissa and I both left North Dakota after college and moved to the city where we hoped to find something that existed beyond the prairie. At the time, this something was unspeakable--our shared secret. But now that we are in our thirties, it just might be time to return home--at least for a sabbatical of some sort--and confront the reasons we left. “Yes! I think it is time to change our lives!” Melissa cheers in her calm way. “I know. I could really use a break from work. From life. From the traffic and the busyness. I mean, how long can we go on like this” I am being dramatic now, resorting to our college chatter. It is easy to fall into this lingo with Melissa. In college we spent long nights together in her small, carpeted apartment, talking about our lives. She played her electric guitar without an amp. I sat across from her on her ragged couch, chewing sunflower seeds and spitting them into a blue mug. The next morning we would do the same. She sat in her ripped pajamas, picking at her electric guitar, and I drank coffee from the same blue mug. I often crashed for the night at her place, too tired to drive across town to my own bed in a small house I shared with three other women. I am about to remind her of this, of our time together, when someone pops a frenzied head in my office. After I deal with the person who wants to know if I can set up a meeting to discuss something we had just discussed, I look out of my window. I notice the landscape: the parking lot, the cement, the buildings, the way my eye is stopped by a delivery truck, blocking my view of the earth. I throw my tissue away, take a breath, accept my dirty key- board, and go back to work. Both Melissa and I know that our daydream of another life--in this case, returning to a past life-- will probably only carry us through the next hour. Returning home is impossible. Over the last ten years I have been trying to resolve a seemingly simple dilemma: how to tell the state of North Dakota that I am gay. This might sound crazy, but if you are from the heart of the country you might understand that you are part of a world that is more connected than any social networking phenomenon of the digital age. Your personal profile is peeked at, commented on, and updated at every hometown shower, funeral, wedding, pig roast, street dance, and Sunday-morning church service-- even if you don’t live in the small town anymore. Living in the city I’ve learned that it is possible to retreat from the world and become anonymous. The more people, the more control I have over my identity--even to the point of erasing it. Yet I can never escape the world where I am from. Every Sunday morning Jerome, the plump man at church, asks my mom how I’m doing. My high school teacher still remembers the state speech award I received in eleventh grade. My neighbor Arlene sends me cards inviting me to stop by for homemade buns the next time I am home. I no longer live with these people, but they still live with me. I will never be anonymous, and yet--I will never be known either. In this part of the world, if you have a secret, it does not necessarily belong to you or your family or even God. It belongs to the place you are from, because eventually to resolve every- thing, to truly find peace, you must come to terms with the place your inner soul calls home. In my case, this place is the North Dakota prairie. The longer I drag my feet on this issue--my confession--the fewer people there are left to tell. Rural North Dakota--well, the whole middle of the country for that matter--has been emptying faster than the draining of a butchered cow. A 2008 National Geographic issue ran an article called “The Emptied Prairie,” which featured the rural areas of my home state in a painfully irreversible population decline. The pictures in the article showed abandoned farmhouses in hauntingly dilapidated conditions, barren except for a few signs of life: a dusty doll, a white nightgown hanging in a bare room, an old woman looking forlorn out of a window onto the empty prairie. The pictures reminded me of villages left behind after military raids: one minute there is life and normalcy, the next minute there is stillness and emptiness. Some attribute this loss to economics or lack of opportunity for young people. I think this emptying--at a cellular or even metaphysical level--has something to do with an even deeper issue: prairie silence. Click here to listen to Hoffert on Minnesota Public Radio's "Lake Effect"